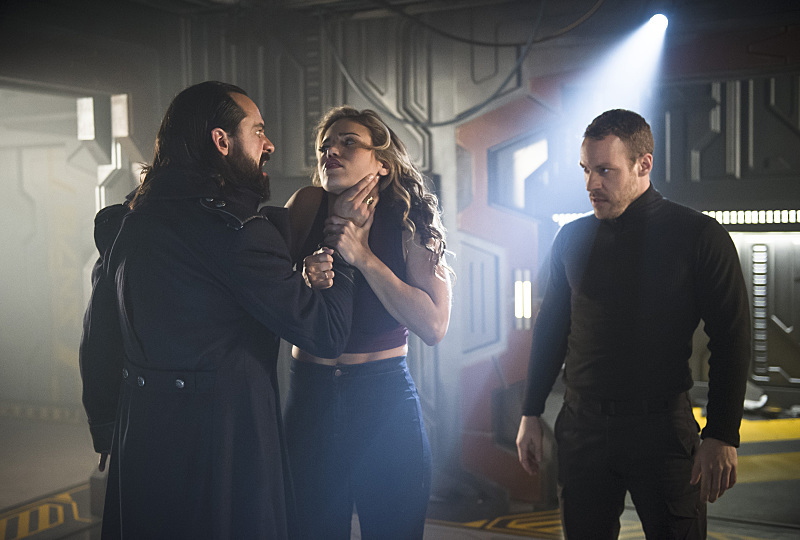 DC's Legends of Tomorrow --"River of Time"-- Image LGN114b_0363b.jpg -- Pictured (L-R): Casper Crump as Vandal Savage, Ciara Renee as Kendra Saunders/Hawkgirl and Falk Hentschel as Hawkman/Carter Hall -- Photo: Diyah Pera/The CW -- ÃÂ© 2016 The CW Network, LLC. All Rights Reserved. We open up in Ancient Egypt and Savage is visiting Rip in prison. Savage wonders about this prisoner but Rip stays mum. Savage mentions how the approaching meteor shower will kill him in his cell. We then see that roles are reversed and Savage is now the prisoner and Rip is visiting him in his cell. The team isn’t happy that Savage is on board. Snart notes that it is dangerous for everyone that Savage is still alive and on the Waverider. Ray and Stein arrive with their findings from Leviathan. The two note the technology is more advanced than what could be found in 2166. Rip realizes that the reason why Savage has been able to evade them is because he has been time traveling too. Rip confronts Savage with this information and he admits that he knew time travel was possible when Rip and company visited him in 1975. This gave Savage 190 years to figure it out. Rip decides to take the Waverider to the Vanishing Point and to the Time Masters to prove to them that his mission was one that was needed. So Rip gets Gideon to push the Waverider beyond its limit and the time drive goes offline. Rip asks Jax to fix the time warp after it goes offline and asks Sara to make sure Savage is safely in his cell. Jax manages to fix the time drive but gets caught in its radiation. We learn that Jax’s is starting to age rapidly and nothing can be done. When Jax got his with the radiation, he flashed back to the moment his mom gave him a watch she was going to give his dad for his birthday. When Sara goes to visit Savage, he taunts her and also tells her that Rip isn’t afriad to betray his team and will sell them out to save his family. We do learn that even with Savage on board, Rip’s family’s fate is still the same. When Sara learns about Jax, Rip admits that he could have made the repairs himself but didn’t’ want to risk what happened to Jax happening to him. Sara realizes that Savage was right about Rip. Meanwhile, Kendra is trying to get through to Carter who is strung up. Kendra tries to remind Carter of his life as Prince Kufo and their son from anoterh life and how tey were a family and happy. Carter grabs Kendra with his legs and starts to choke her but Ray punches out Carter. Ray then goes to Savage and demands he tell him how to unlock Carter’s mind. Savage says he could tell Ray but does he really wants to lose the woman he loves to Carter once he does. Ray believes that Kendra will choose him and Savage taunts Ray about losig another woman to another man. We then flashback to when Ray said goodbye to Felicity before he left to gon on his time travel mission. Ray needs to go on this mission to have a purpose with his life and for a chance to save the world. Felicity gives Ray a pep talk and the two part with a kiss on a cheek. When Ray goes back to Kendra, he sees her reciting a love poem to Carter asking him to come back to him and caressing his face. Kendra notices Ray and goes to him. Kendra tells Ray she does love him but when Ray asks if she can assure him he isn’t a place holder for Carter, she doesn’t reply. Snart and Rory are having a sense that something bad is going to go down and wants out. Rip offers them the time ship for its one and only jump back to Central City 2016. Snart and ROry perpare to leave while Sara decides to stay as he never runs from a fight. We flash back to Sara visiting Nyssa at Nada Parbat shortly after she destroyed the Lazarus Pit and is now in prison. Sara wants to help Nyss get out but Nyssa begs her love to forget the past and move one. Stein goes to visit Savage to find out how he can save Jax. Stein asks about the blood ritual in 1975. Savage says that the ritual involved taking Carter’s blood and since they have him prisoner then he can take it from him. However, Stein gets an idea on how to hlpe Jax without spilling Carter’s blood. Stein places Jax in the jump ship and knows that if Jax goes back in time to 2016 then this should reverse the radiation. Stein asks Jax to say a proper goodbye to his wife Clarissa. When the jump ship leaves, Stein flashes back to a time Clarissa paid him a visit at Star Labs and had to cancle a lunch date to discuss time travel with colleagues. Stein tells Clariss how much he loves her. Snart and ROry aren’t pleased about their ride home was hijacked by Stein. Ray goes back to Savage. Savage sees that Ray is heart broken and tells him how Kendra once was in love with him but their love was destroyed when Carter came back. Savage tels Ray that he doesn’t have the guts to face him so Ray opens the cell and attempts to fight him but Savage gets the upper hand and escapes, frees Carter and takes down Gideon. Ray tells the team about Savage’s escape. Rip tasks Ray, Snart and Rory to re-capture Savage while he, Stein and Sara will manually fly the Waverider to the Vanishing Point. Rip then leaves Sara to fly the Waverider while he goes off to help Rory, Ray and Snart. In the halls of the Waverider, Savage is more than holding his own against our Legends while Kendra confronts Carter. When Savage is about to shoot Kendra, Rip gets in the way and takes the laser blast. Meanwhile, Savage grabs Kendra and is choking her to death and this awakens Carter as he remembers his past lives and his love for Kendra and battle Savage. Savage stabs Carter. Kendra knocks him out and luckily Carter is still alive. Later, Ray tells Kendra that Carter is going to be okay. Kendra tells Ray that what they had was real ray thanks Kendra for showing him that he could fall in love again and want to share his life with someone and udnerstands that it won’t be her. The team arrives to the Vanishing Point and is taken in by the Time Masters. Rip meets with Time Master Druce and presents them Savage and shows him admitting to time travel. But the real twist is that Druce has been working in league with Savage and releases him back to 2166. The Time Masters round up the team but Sara and Snart manage to hide. We see Ray, Kendra, Stein and Rory being taken prisoner by the Time Masters. We see Rip has changed into a leather and jean combo looking like something out of Grease when Savage visits him and tells him how much he looks forward to meeting his family in 2166.